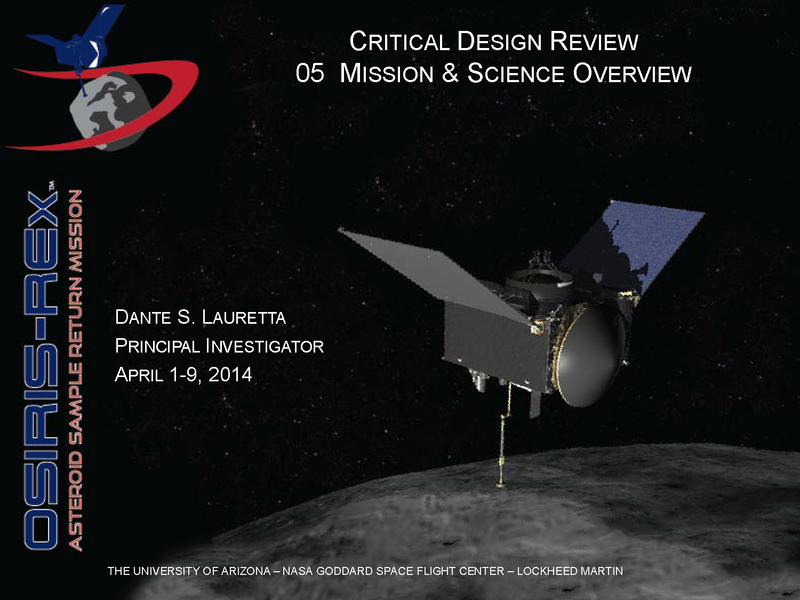 Yesterday marked the final day of the OSIRIS-REx Critical Design Review (CDR). This review began on April 1, 2014 and spanned nine days – with one day off in the middle. 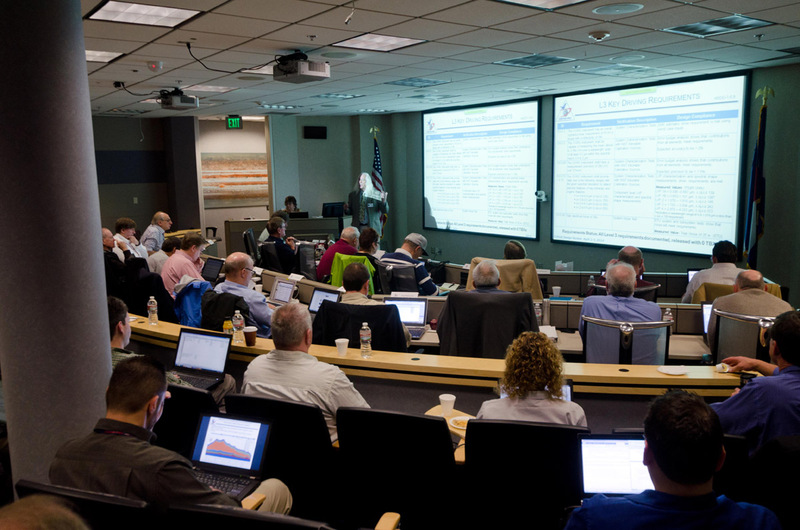 Over 60 OSIRIS-REx team members presented almost 1,600 PowerPoint charts in 56 hours. 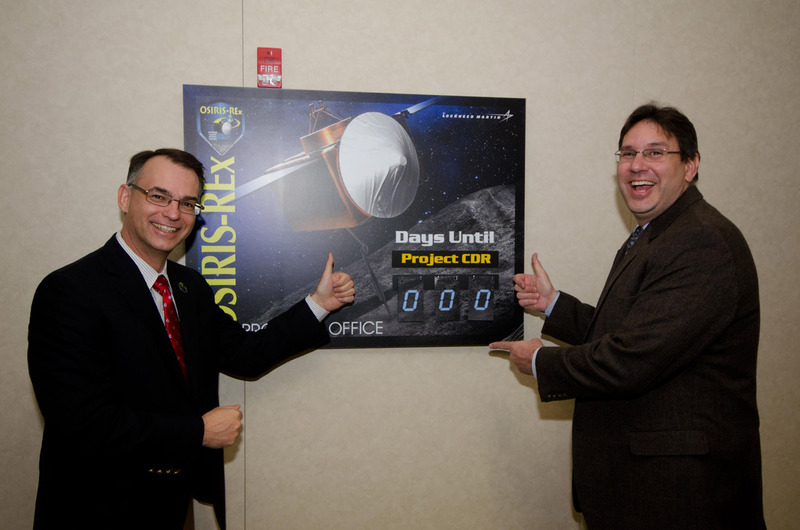 Rich Kuhns, OSIRIS-REx Flight System Manager at Lockheed Martin, and I celebrated the start of CDR by updating the countdown clock. Since a CDR is required for all elements (i.e., spacecraft, instruments, and ground systems), the information that we presented was a summary of 28 preceding subsystem Engineering Peer Reviews (EPRs) and CDRs. It has been an exhilarating and exhausting experience. I have enormous pride and respect for the team members; they demonstrated their knowledge and maintained their poise under intense scrutiny. 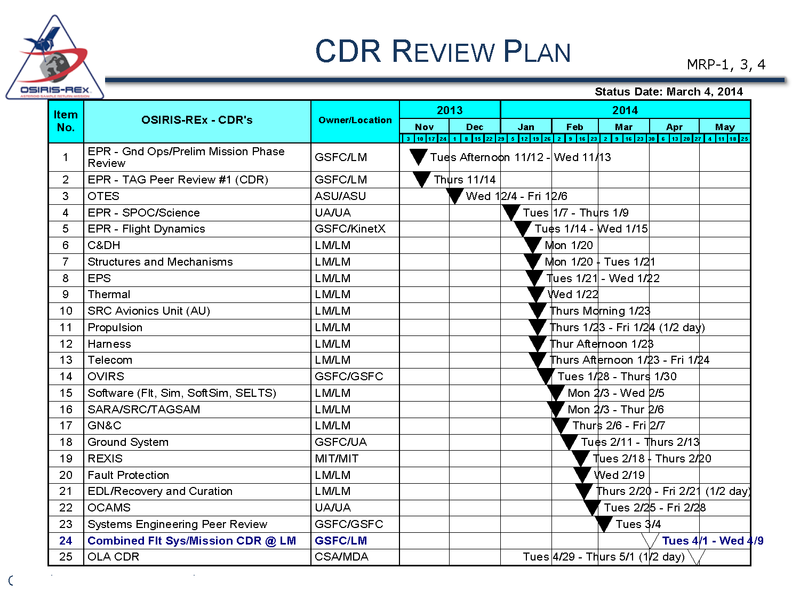 The “CDR Waterfall” showing all of the subsystem EPRs and CDRs leading up to this review. Richard “Spe” Spehalski chaired our Standing Review Board (SRB). Spe is best known for his management of two of NASA’s most historic flagship science missions – the Cassini mission to Saturn, launched in October 1997, and the Galileo mission to Jupiter, launched in October 1989. The board is composed of experts in all aspects of spacecraft mission design and operations, including Gentry Lee, the chief engineer for the Planetary Flight Systems Directorate at the Jet Propulsion Laboratory, Steve Scott, Chief Engineer for the Goddard Space Flight Center, and David Kusnierkiewicz, Chief Engineer at the Johns Hopkins University Applied Physics Laboratory. In total, there are 14 SRB members and 7 SRB consultants, covering all areas of technical expertise needed to evaluate the OSIRIS-REx mission design. The OSIRIS-REx SRB is comprised of technical experts from across the United States. 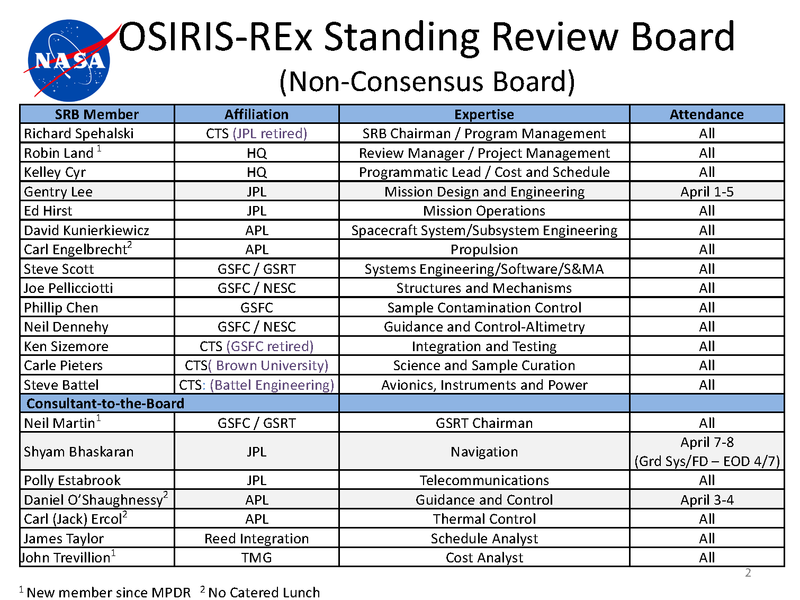 The SRB evaluated all aspects of OSIRIS-REx mission design. As the name suggests, the CDR is a critical step in the development of our mission and represents the completion of the final design stage. Our job is to demonstrate that the maturity of the design and development effort justifies proceeding with full-scale fabrication activities, assembly, integration and test. We also have to show that the project is on track to complete the flight system, ground system, and mission operations development. The amount of information needed to convey this is enormous; we presented the final design and interfaces by means of drawings, block diagrams, power flow diagrams, signal flow diagrams, interface circuits, software logic flow and timing diagrams, modeling results, and breadboard and engineering model test results. After we digest the review board findings, we will freeze the design of spacecraft and begin fabrication in earnest. As you will see in my next post, we are in great shape and some flight hardware is already in place. Finally, as always, we must meet mission performance requirements within the identified cost and schedule constraints. I started the CDR with an overview of the science objectives and overall mission plan. The OSIRIS-REx team passed the CDR with flying colors. The SRB found no show stoppers and was impressed with the extensive communication across the team. They were particularly complementary to the role of the science team across all elements of the mission. They also noted strengths in our comprehensive and high quality subsystem reviews, the fact that most of our workforce issues have been resolved, the incorporation of lessons learned from prior missions, the high heritage of our design, and the excellent processes for cost and schedule control. We celebrated the CDR with commemorative artwork and promotional items. The SRB presents their findings as both Requests for Action (RFAs) and Advisories. An RFA is a formal written request from the review board that asks for additional information from and/or action by the Project. An Advisory is a comment or suggestion provided to the Project that merits important consideration. At the end of the review we received 22 RFAs and 12 Advisories. These are meant to help us focus on key areas of development which need special attention. I have every confidence that the team is up to the challenge and will deliver a very capable spacecraft for launch in September of 2016. We celebrated the successful CDR with the launch of a new website design. 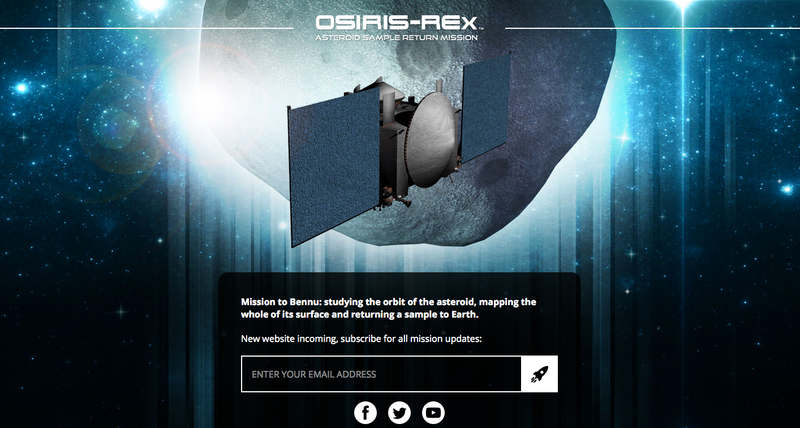 Check us out at asteroidmission.org to follow along with the mission! Our new website was launched to celebrate a successful CDR!